The "Flou Technique" seam apply to feminine clothes made from soft, fine and light materials, such as organza, silk, crepe, chiffon, cotton voile, taffeta, lace or embroidery. Materials, thread and techniques require patience, care and excellent dexterity for a perfect garment?. Fonlupt's Productions have the right industrial equipment and experienced seamstresses mastering all the elements for a quality production and an impeccable finish. Fonlupt's Productions' expertise in this area includes several kinds of products like blouses, tops, skirts, dresses, evening dresses and wedding dresses. Our expertise in these high end ready-to-wear products is recognized by major French luxury houses. By our organization (Service methods, scheduling / launch, engineering, control quality materials and finished products, “Collection” groups), we meet the requirements of quality, price and deadlines? requested by our clients. Long sleeves (jackets, coats, peacoats, trench coats) or “Flou Technique” (dress shirts, blouses, evening dresses) and don’t forget the accessories! We are able to meet the demands for a wide range of productions and materials (double face, well-known leather work mastering, silk and organza …). Our expertise, our listening to our customers and our ability to constantly adapt are the reason for the confidence placed in us by major French luxury houses with whom we have had the privilege of working for several decades. With the strong trust from our clients, a state-of-the-art manufacturing plant and a young and passionate team, our companies perpetuate the know-how and look with confidence and ambition toward the future. Thierry Establishments were distinguished by a Fashion Trophy in 2013 (Trophée de la Mode). For its tenth anniversary, on April 10 and 11 of 2013, the show “Made in France” created at the initiative of the French Union of Clothing Industries (UFIH), presented for the first time his Fashion Trophy. This award is intended to highlight what makes the excellence of “Made in France”: dexterity, quality, patronage, accuracy. Exhibitor participants worked on a drawing or silhouette patterns designed by Christophe Josse. Each participating company had to demonstrate their knowledge, special skills and ability to value a creation. The result of this work (dress or cape) was presented on the companies’ booth at the show. The jury was composed of Adeline Andrée, Nelly Germain – Technical Director Hermes Women -, Mario Lefranc – Director of Creation Workshops Hermes Women – and Christophe Josse. 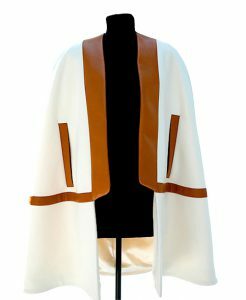 Thierry Establishments were awarded first prize for the creation of a superb white wool cape braided with plunged lambskin leather and with a silk lining.